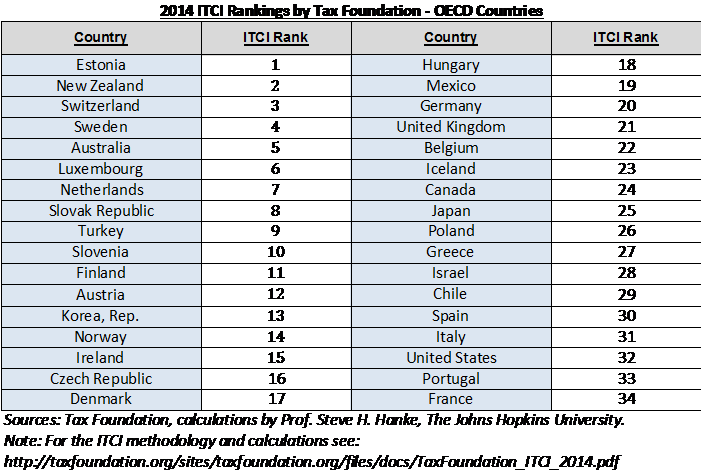 The Tax Foundation released its inaugural “International Tax Competitiveness Index” (ITCI) on September 15th, 2014. 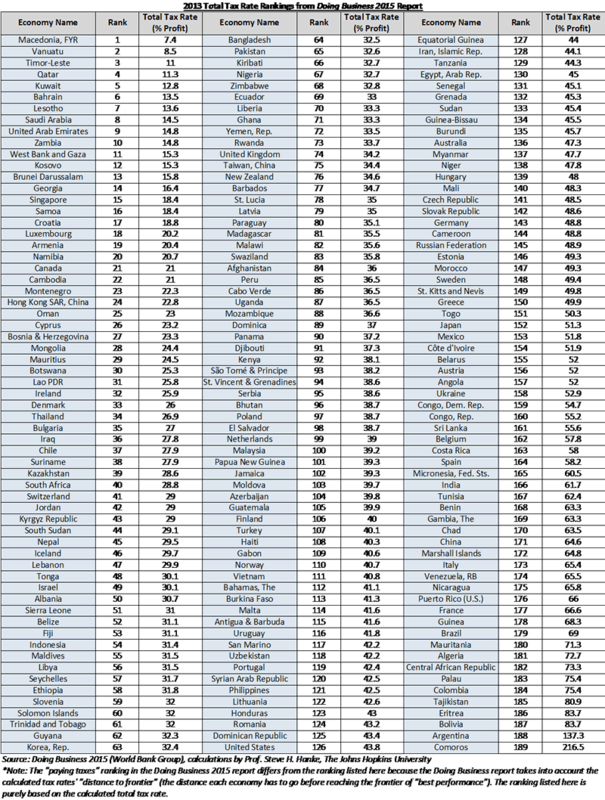 The United States was ranked an abysmal 32nd out of the 34 OECD member countries for the year 2014. (See accompanying Table 1.) The European welfare states such as Norway, Sweden and Denmark, with their large social welfare systems, still managed to have less burdensome tax systems on local businesses than the U.S. The U.S. is even ranked below Italy, the country that has had such a pervasive problem with tax evasion that the head of its Agency of Revenue (roughly equivalent to the Internal Revenue Service in the United States) recently joked that Italians don’t pay taxes because they were Catholic and hence were used to “gaining absolution.” In fact, according to the ranking, only France and Portugal have the dubious honor of operating less competitive tax systems than the United States. The ITCI measures “the extent to which a country’s tax system adheres to two important principles of tax policy: competitiveness and neutrality.” The competitiveness of a tax system can be measured by the overall tax rates faced by domestic businesses operating within the country. In the words of the Tax Foundation, when tax rates are too high, it “drives investment elsewhere, leading to slower economic growth.” Tax competitiveness is measured from 40 different variables across five different categories: consumption taxes, individual taxes, corporate income taxes, property taxes, and the treatment of foreign earnings. Tax neutrality, the other principle taken into account when composing the ITCI, refers to a “tax code that seeks to raise the most revenue with the fewest economic distortions.” This would mean that tax systems are fair and equally targeted towards all firms and industries, with no tax breaks for any specific business activity. A neutral tax system would also limit the rate of – amongst others – capital gains and dividends taxes, all of which encourage consumption at the expense of savings and investment. Even the two countries that have less competitive tax regimes than the U.S. – France and Portugal – have lower corporate tax rates than the U.S., at 34.4% and 31.5%, respectively. The U.S. corporate rate on average across states, on the other hand, is at 39.1%. This is the highest rate in the OECD, which has an average corporate tax rate of 24.8% across the 34 member countries. According to a report by KPMG, if the United Arab Emirates’ severance tax on oil companies was ignored, the U.S. average corporate tax rate would be the world’s highest. The poor showing of the U.S. resulted from other countries recognizing the need to improve their competitive position in an increasingly globalized world. Indeed, the only OECD member countries not to have cut their corporate tax rates since the onset of the new millennia are Chile, Norway, and, yes, the United States. The high U.S. corporate tax rate not only raises the cost of doing business in the U.S., but also overseas. The U.S., along with just 5 other OECD countries, imposes a “global tax” on profits earned overseas by domestically-owned businesses. In contrast, Estonia, ranked 1st in the ITCI, does not tax any profit earned internationally. Since these profits earned overseas by U.S.-domiciled companies are already subject to taxes in that specific country, there is a clear incentive for American companies to try to avoid double taxation. Indeed, many of the largest American multinational corporations have established corporate centers overseas, where tax codes are less stringent, to avoid this additional tax. The ITCI also reported a myriad of other reasons for the low ranking of the U.S., including poorly structured property taxes and onerously high income taxes on individuals. One major reason why the U.S. lags so far behind most of the industrialized world is simply the lack of serious tax code reforms since the Tax Reform Act of 1986. According to the rankings in the most recent Doing Business 2015 report (which reported total tax rates for the calendar year 2013), Macedonia had the lowest total tax rate in the world at 7.4% and was followed closely by Vanuatu at 8.5%. The United States, as in previous years, appears near the bottom of the list, at 126th out of 189, with a total tax rate of 43.8%. The fact that both the ITCI and Doing Business report, whose methodologies and calculations were conducted independent of one another, rank the United States very low shows that the tax rates in this country are non-neutral and uncompetitive, no matter how they are measured. The message is clear, and very simple: taxes on corporations increase costs and decrease margins, and lead to price increases on goods and ultimately hurt the consumer and the development of any country. As proposed in “Policy Priorities for the 114th Congress,” published by the Cato Institute, to increase the incentives of domestic firms to go into business and become competitive globally, the U.S. would have to drastically reduce its corporate tax rate.